One of the most critical influences on a company’s investment rating is how information is communicated to the investor community. Gaining the attention of this audience in the right way, and at the right time, is highly competitive and requires expertise, focus and commitment. A successful investor relations programme will build a knowledgeable and supportive following among institutional and retail investors and brokers. This in turn will help underpin the share price, maintain the company’s rating within its peer group and facilitate future corporate activity. We help our clients to meet with targeted investors and develop ongoing communication strategies to maintain their interest. The success of these strategies can be measured by tracking perceptions within the investment community. Articulating and communicating your corporate story well is crucial to your IR objectives. Many fundamental questions need to be answered when doing this. Dickenson helps you evaluate how the market is viewing your sector and how you are valued relative to your peers. We help you plan your IR objectives for the next 4 quarters and help you execute it. 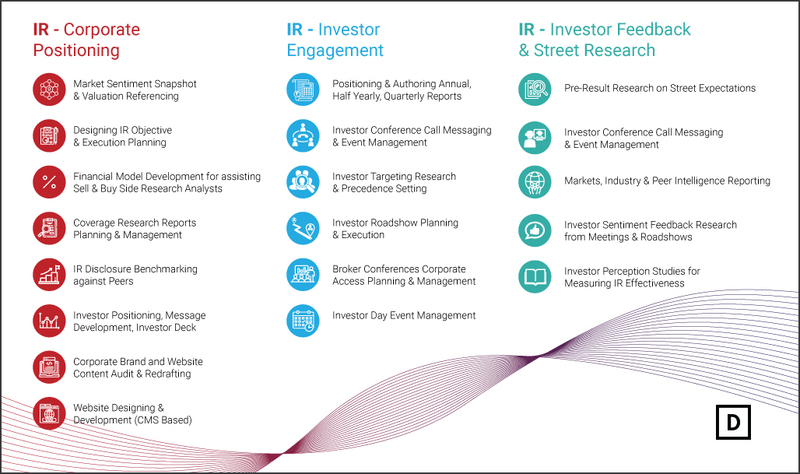 Dickenson can articulate and author your Annual Report; craft your Investor Conference Call Messaging; implement your investor targeting research and precedence setting; organise and plan your broker conferences and corporate access events; and establish and run your investor day event with end-to-end responsibility. Feedback from the marketplace is critical for understanding the investor community’s perception of the company. This feedback is instrumental for devising communication strategies that foster a better understanding of the company. Engage with us on a one-to-one basis and get case studies of ways in which we have served and impacted our clients.